In the 1960's, a second generation of electronic material was developed - the III-V compound semiconductors, composed of elements from groups III and V of the periodic table. These compounds form the basis for manufacturing of all optoelectronic components and high performance microwave and digital system markets. 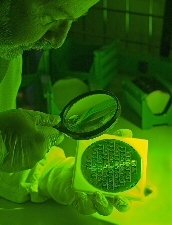 A third generation of electronic materials is wide bandgap semiconductors (WBS). Due to their outstanding physical properties, devices made from these materials have potential operating characteristics far superior to those made from Si, GaAs or InP in high power, high temperature, high frequency and short wavelength applications. These items are specialized and are not in our current inventory list, but we may be able to obtain the II-VI or III-V wafer you are in need of. Please fill in our Request a Quote form and we may be able to help you find those II-VI or III-V wafers.